ATOPMEX/Gold Terra is both, a full-range precious metal dealer company and a low overhead discount broker. Our vision is to offer a wide variety of bullion and numismatic products, extensive broker expertise, and fair pricing. Atopmex are 5th-generation precious metals dealer, based out of Ontario Canada and originating in Russia. Carrying an extensive range of bars, coins and numismatics through an easy to use e-commerce website, Atopmex buy and sell precious metals both nationally and internationally. 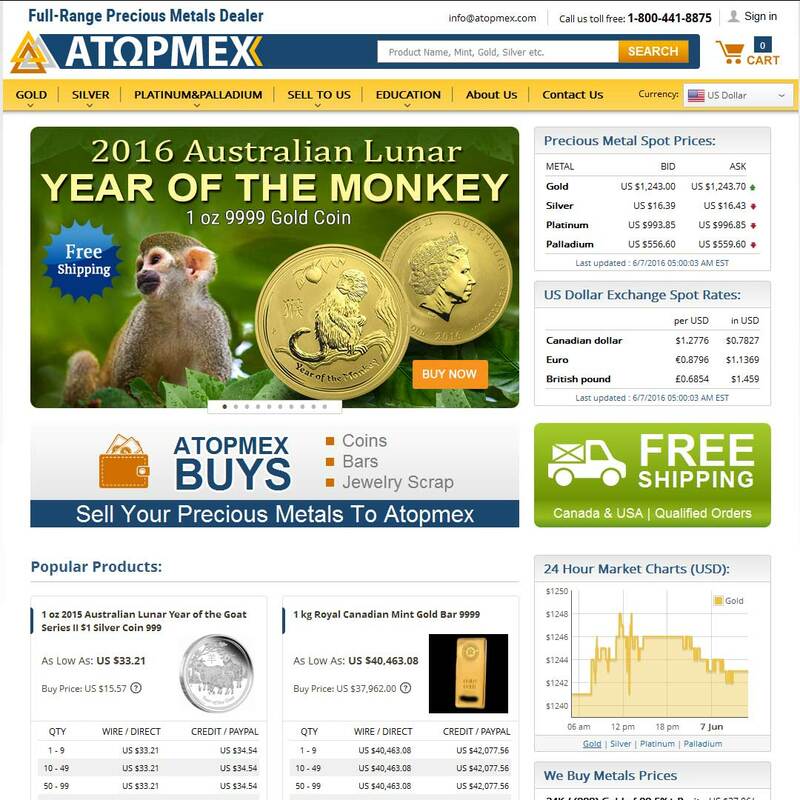 When doing business with Atopmex - please say you saw them in Bullion.Directory. Read or add Atopmex reviews and ratings using the "reviews" tab above. All Atopmex details are believed to be correct at the time of listing. Please report errors here. Last week I’ve ordered silver bars and it took 3 days to receive them. I live in Mississauga, so I didn’t pay for the shipment, as I picked up my order from the office directly. The processing of request took about 2 days, because I wanted to order 1kg valcambi silver bar and three 100g and I didn’t find 1kg bar at their website, so I wrote to support team and they told me they will satisfy my request in a day or 2. Since May I’ve been purchasing here gold coins and silver 1 oz rounds, choosing best priced items. I’ve been ordering more silver rounds I’d say. I prefer ordering gold coins with volume discounts. Not all products have them though. The previous time I purchased gold I’d chosen American Buffalo and saved some money (I took 20 coins and saved about 130 dollars). I would give 4.5 stars. I think it would be more convenient for stackers like me to see everything online instead of asking support to make a special order for me. Though it might be a pleasant thing for extra or unordinary orders. A month ago I ordered two Valcambi silver bars, each 100g weight, those little bars that divided into squares, makes it perfect to store and no overpaying for the pack as I would if I took 220 1g bars. Wholesale purchase is always cheaper and more comfortable. I decided to order gold one a week ago, just paid for it 2 days ago so now waiting for it. The manager told me they are receiving new items regularly so no worrying, wills ee if they have something interesting later. I’m a newbie in buying gold and luckily I started with Atopmex. I purchased 1oz Gold Maples and shipping was surprisingly fast. Quality was great, I’m fully satisfied. Price was moderate, not minimal but then there were no hidden fees from the dealer. Also I’d like to thank Alex (manager) for his consultation, he was very helpful and professional. Well, my rating says for itself, but I would also add that I really enjoyed buying from Atopmex, good prices for Maple Leafs, everything has been delivered quicker than I’m used to buying from others, the deal was really easy, will be trying to buy from them again, hope my experience should repeat again.